One of the younger generation of Native Hawaiian quilters in the Ka Hui Kapa Apana O Waimea Club, Sharon Balai of Waimea, Hawaii, is known for her ability to create innovative and complex patterns. She is also a strong advocate for protecting the cultural rights of ownership of traditional Hwaiian quilt patterns. She explains how this quilt, “Kaumoha Koli’i”, represents and speaks of marriage and was designed specifically to symbolize the union of Hawaii’s cultural past with the introduced materials, ideas, and influence from other cultures. Nothing on or of this quilt is native to Hawaii but for the Hawaiian cultural system that brought in the tradtions and the unique expansive concept of the eightfold process. The pattern of open hearts has a message to all who see it, saying “Na pua o Hawaii aloha” (from the flowers [children] of Hawaii, greetings of love). As is customary in Hawaii, the name also has a second meaning: Kaumoha is a heaviness or burden due to a troubling situation, such as sadness or grief: Koli’i is a disappearing or diminishing, such as water evaporating or a ship sailing off into the horizon. This quilt’s other name, “diminishing burden,” refers to the quilter’s sustained thoughts and feelings while this quilt was in progress. Occasionally the Ka Hui Kapa Apana O Waimea group on the Big Island of Hawaii makes quilts for educational or service organizations. During 1996-97 they made two identical sampler quilts; one was given to Michigan State University Museum, the other the Hamakua Health Center in Honokaa, Hawaii, originally a small medical dispensary serving plantation workers of the now-defunct Hamakua Sugar Company. 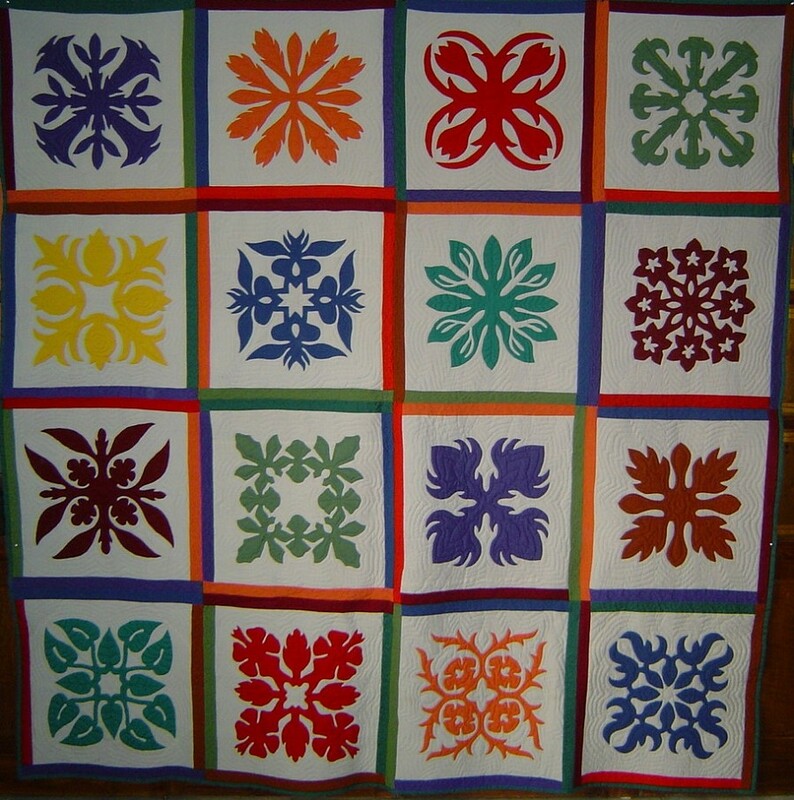 The quilt features the following components: sugar cane (in the center), an inner cross of squares depicting flowers that grow well but are not medicinal, an inner cross of squares depicting food items that my be used as medicine, and outer border of squares showing plants used medicinally by some but also used as decorations or food.